If a tree falls in a forest but no-one sees it, did it really happen? 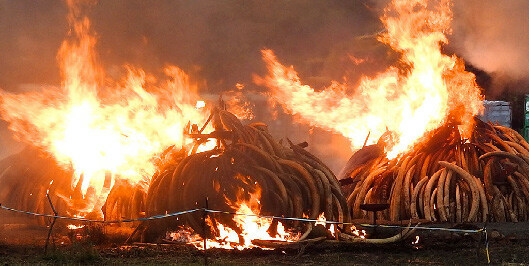 What if you staged a mass tusk burning as a signal to world that ivory poaching is not worth it. Is anyone noticing? This was the question posed by an international group of scientists (including several CEED researchers). Ivory poaching is taking an enormous toll on African elephants. In recent years there has been some success with enforcement resulting in stockpiles of seized tusks. These stockpiles are then destroyed in mass burnings designed to send out a strong message against ivory consumption. But is the message getting through? University of Queensland researcher Alexander Braczkowski and colleagues set out to see by analyzing media coverage of a recent mass burning in Kenya, the largest ivory-destruction event so far. They examined the media impact across eleven important nations to the ivory trade. Duan Biggs, a CEED alumni and co author on the study, said that with no real measure of the effectiveness of these conservation marketing events, there is no way of judging if they achieve their objectives of reducing ivory demand and supporting elephant conservation. Check out CEED’s interactive photo story on this research. And while we’re on the topic of tusks, late last year Duan Biggs and colleagues scored a paper in the prestigious journal Science. They contend that the deadlock on ivory could potentially be overcome through a structured process which incorporates both values, differing perceptions of trade-offs, and scientific evidence. 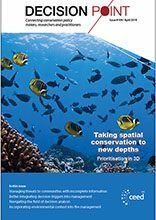 The taboo trade-off (when one trades off a secular value like money with a sacred value like “elephants are sacred and therefore selling ivory is wrong”) is a hitherto un-addressed issue in the ivory debate (and is also relevant to the trade of other iconic species like rhinos and turtles).